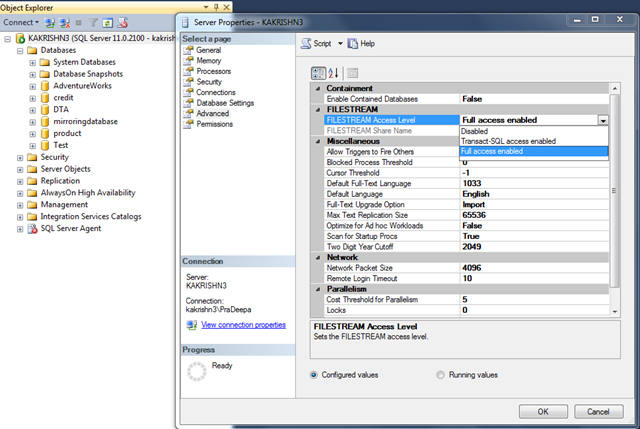 How to enable Filestream in SQL SERVER 2008 and SQL Server 2012? Filestream was introduced in SQL Server 2008 for the storage and management of unstructured data. Follow the below steps to enable this filestream in SQL Server2008.Let us see one by one. 2.Select the instance for which you want to enable Filestream.Right click the instance->properties. 3.In the SQL Server Properties dialog box, click the Filestream tab. 4.Select the Enable Filestream for Transact-SQL access. 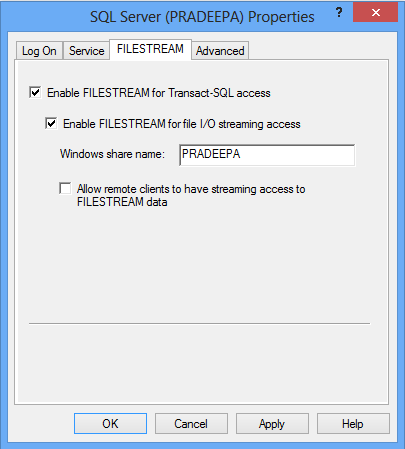 5.If you want to read and write Filestream data from Windows, click Enable Filestream for file I/O streaming access. Enter the name of the Windows share in the Windows Share Name box. 6.If remote clients must access the Filestream data that is stored on this share, select Allow remote clients to have streaming access to Filestream data. We can enable file stream while creating the database (or) If the database is already created we can enable filestream using alter database. 2. In the Object Explorer, right click the instance and select Properties. 3. On the left panel click on the Advanced tab, then click on the drop down list of Filestream Access Level and select Full access enabled option. 4. Click Ok to save the changes.